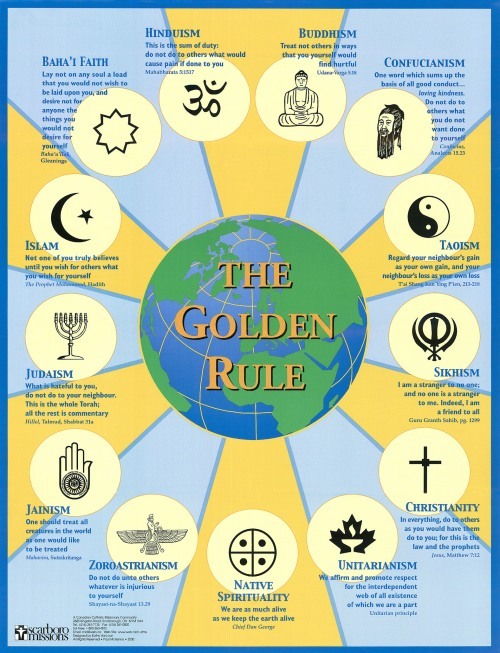 The Golden Rule, with its various incarnations, permeates religious thought. And while it can be formulated in many ways, the most common way to express it essentially states that you should treat others as you would want to be treated. It emits an attempt at fairness in action, making sure that one does not make a double-standard by making exceptions for yourself that you don’t allow for others. Fair enough. And while I think that the Golden Rule is best said when it attempts to treat others as they wish to be treated, due to the fact that what I want is not necessarily what others want, I think that this is often problematic because we do not know what others want. 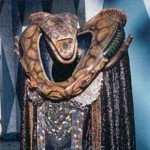 We could ask what people want, I suppose, but the practical application of this is insurmountable on a societal scale. I think that the general idea is to act such that those actions create a world that is consistent with our desires, while keeping in mind the desires of others and their ideal worlds. Thus, as a general rule, to act in such a way that would be consistent with a desired world which is created by those types of actions is a good place to start. Figuring out an ideal world that we can all agree on is probably the biggest problem. And so what do we, the new atheists, do? (And yes, I still dislike the term). Our criticisms are not always appreciated by other people, especially strongly religious ones. We try to speak out in order to be able to gain acceptance in culture, to stop theocratic intrusions into government policies, and to make sure that theology stays away from science so that we can continue the process of understanding unimpeded by silly mythology (i.e. creationism) and other superstitions. But are new atheists following the Golden Rule? Should we follow the Golden Rule? 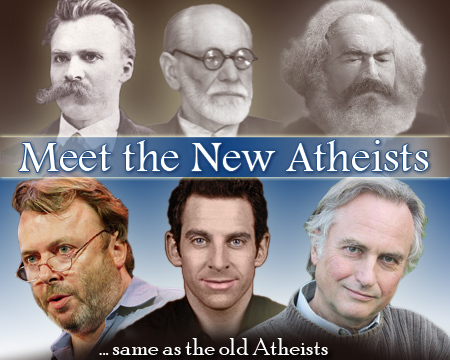 Are faitheists and other critics of the new atheists following the Golden Rule? Not all atheists are skeptics, nor are all skeptics atheists. I agree with people such as Matt Dillahunty, that to be a skeptic should lead a person to be an atheist. Why? Because I don’t think there is any evidence to believe in any gods, and without evidence in such things, one has no cause for a belief in any gods. Thus to be skeptical concerning the question of gods, without sufficient evidence to believe in them, must lead to atheism as the only reasonable conclusion. As soon as there is evidence, then a skeptic has to address that evidence. But there is no good evidence that I know of, and I have been looking. Skeptics, at least “real skeptics” (I’m being playful, not trying to drag in a “true Scotsman”), encourage criticism of all kinds of beliefs. Skeptics are all about the evidence, use of rationality to address that evidence, and accepting as true what the evidence points to. As an implication of this, I think that skepticism would desire a world where open debate, conversation, and challenges to beliefs would be encouraged. A world where all of the data is explored, all sacred cows inspected, and people are encouraged to have a real desire to know what is true and not just what is preferable or easy. This is antithetical to faith, by definition, and is what the current public atheism is all about, at least concerning the questions of religion, gods, and faith. The criticisms of religion are ancient, in many cases. These ideas being promulgated is what is new, and religious people are not used to hearing these ideas. Another, hopefully obvious, implication of being a skeptic is that a person should be open to have their own beliefs challenged. Thus, when the superlatively respected skeptic James Randi wrote this piece the other day about Global Warming, he was appropriately challenged by various people in the skeptical and atheist community. And while his point may be valid (or not), he is willing to accept the criticism and respond to them, rather than claim persecution as many Christians often do when criticized in the same way. I would think that Randi encourages the challenges in general, even if he may not have liked some of them specifically (As his follow-up seems to imply). The bottom line is that when skeptics make claims, hold beliefs, or sign on to something, they should be willing to accept criticism when it comes their way. These implications are an essential part of a skeptical worldview. It is how we want to live, the kind of world we want to live in, and how we think one should act with other people. 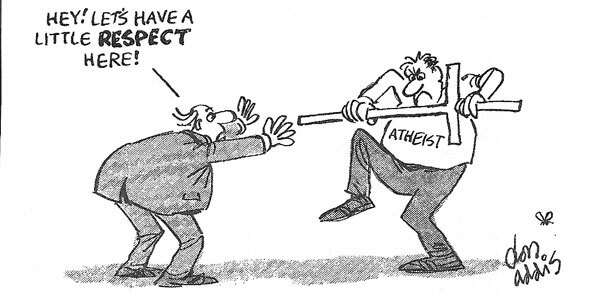 Therefore, when the new atheists, insofar as they are also skeptics (and many of the leading atheist speakers and writers at least attempt skepticism), offer public criticism of religion, faith, etc, they are following the rule of treating others as they want to be treated. They are acting in such a way that is consistent with creating a desired world that the actions they make will create. I want a world where people’s beliefs are challenged when such criticism is warranted. I want a world that is not simply based upon faith, but rather evidence, reason, and an attitude of curiosity. I want to help create an environment where skeptical inquiry is supported by people rather than blind (or at least partially obscured) faith. And I know that many of my fellow atheists share this desire, and so we are simply following what we think the right thing to do is, according to the very “Golden” rule that religions share. So, if there is a problem with the actions of atheists these days, then the problem is with the rule itself, not with our actions. But wait, didn’t I say that I liked the other formulation of the Golden Rule better? I said, above, that I prefer the idea that one should treat others as they want to be treated, and not merely as how I want to be treated myself. I said that the issue was that I didn’t know how others wanted to be treated all of the time, creating a practical problem with implementing the idea, not a problem with the idea itself. I also stated that this will lead to inevitable conflicts of opinion about what kind of world we want to live in. We know that many religious people tell atheists that they do not want us speaking out. They don’t want our billboards, our books, or in many cases they don’t even want us (to exist). Now, if they are willing to lay down their arms, then they might have a point. And many religious groups do not proselytize, advertise, or otherwise bother the public. But the simple fact is that religion is part of pur culture and public life, and so to demand that atheists keep quiet is a double standard, violating the very essence of the Golden Rule itself. We have as much of a right to speak publicly about our lack of beliefs (as well as whatever actual beliefs we hold in addition to that lack) as theists do. It does not even matter if the United States were a Christian nation (which it is not), because that would not take away our freedom of speech, freedom of conscience, and freedom of opinion. To simply capitulate to some religious people’s desires to not have us vocal, they further create a double standard when they don’t treat us as we want to be treated; to be allowed to speak publicly if we want to. The result is the collapse of the rule. They want to be left alone by us, we want to have a dialogue in the public square where they are, and both cannot be attained. Some compromise must be reached. Atheists do not, and should not, disrupt private worship. Atheists do not, and should not, take god away from people’s lives, mostly because we could not possibly do so anyway. And despite the mythology by many in the religious community, we are not taking their god out of the public square or schools. We are only arguing and working towards government neutrality concerning religious ideas. The government should be secular (which is not the same as atheistic). Do what you want privately, just don’t expect the government or it employees to condone or lead those activities. Religious groups should not tell atheists that they cannot advertise on billboards. They have a right to be offended. They should not claim that their faith is beyond criticism out of some misplaced desire for respect. They have to keep in mind that if they do bring their beliefs to the public square, they have to accept the criticism along with the conversions. If they want to recruit new members, they have to accept that potential new members might offer that very criticism. And if they want to write books, then they have to accept that we will write books as well. And, of course, most do except these rules, even if they do so unhappily. That’s fine, because here we have the right to pursue happiness, not necessarily to be happy. What I find fascinating is the idea that this criticism is itself is bad. The idea that we should not criticize is worthy of criticism itself; why is criticism bad? Isn’t the idea that criticism is bad a kind of criticism? What if I am offended by that opinion? What if my strong belief is that criticism is good, and the accomodationist or faitheist critic of my criticism is violating my rights and tastes? Perhaps they should shut up. No, I don’t believe that. They should, I think, re-examine their assumptions and reasoning, however. I am doing unto others what I would want done unto me. The believers who want us to shut up are just protecting their beliefs from scrutiny. Those faitheists who say I should not criticize are not following this Golden Rule, violating it because they don’t want their own beliefs, the idea that people should not criticize certain things, to be criticized . They might see some hurt feelings if we keep this up while making them look bad, while hiding beneath our shadow, to the rest of our culture. No. They are doing a good job of looking bad without our help. 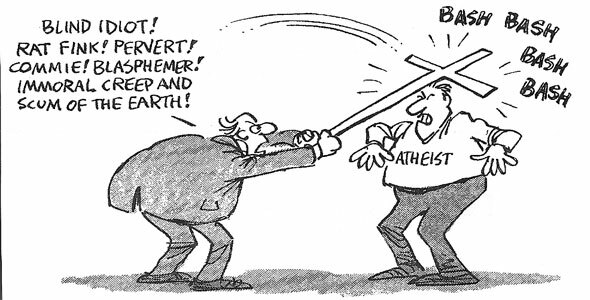 One of the criticisms of the methods of people like myself–the so-called new atheists–is that we will cause a kind of backlash from believers and others who are sympathetic to the effect of criticism upon the religious and otherwise theistic worldviews. A fair criticism that I hear from appeasers quite often. But rather than address the arguments of appeasers, I want to address the importance of being willing to accept challenges to personal views. It is this that makes justifiable the reasons for people to be squeamish about the efforts of people like myself. And while I hold no unjustified delusion that I will be able to change this aspect of human psychology in any significant way, I might at least have an affect on a few people. This is all I can hope for. I believe in perpetual self-challenge. I think that it is important to keep a level of skepticism and lack of resoluteness in my own ideas, in the hope that they will not crystallize into a kind of creed or stubbornness of my own views. It is this idea, and I share it with many atheists, that makes the claim that atheism is a faith absurd. Let me stop and address that issue for a moment. I will admit that there are some people that I know and who are atheists for whom the nonexistence of god becomes a point of certitude that I find epistemologically irresponsible. They, understandably, laugh at the mythical nature of religious ideologies, but they sometimes go further and conflate these mythologies with the larger question of whether any god might exist. To conflate specific gods with the general question, in my opinion, is a mistake that is made by many an atheist I have known. And so the claim that atheism is merely another kind of faith, while absurd when fully analyzed, has a kernel of truth to it on the surface. Thus, I understand that many caricatures of religiosity are not fair in the same way that caricatures of the angry, petulant, and intolerant atheist is based upon some unsavory few who make themselves look foolish. Let me be clear here. I recognize that religious people are not all unthinking, boorish, ignoramuses who are all making the world a bad place. I recognize the importance of religious traditions in people’s lives, and the positive effects it can have on people. I also recognize that the idea of god is one of great inspiration to people, and that in many cases the idea can be beneficial to some. I recognize these things, and still see room for criticism of these ideas. Why? Because I actually care about the truth. I would prefer to have true beliefs, ones that can be supported by the best methods and evidence that we have available. I think that this value of mine is important, and I would like it to be shared by people, if possible. But there are barriers between this ideal world and the one we live in. People are largely pragmatic and are not concerned with the truth so much. They are more concerned with, and I understand why, things like where their food is coming from, raising their children, and simply enjoying their lives. No time for silly questions about truth about religion or deities. Oh, but they believe in them whenever an arrogant person comes along and says that they are an atheist. And suddenly this nonchalance disappears from their lives when someone who actually has thought about this issue comes along and calls it mythology. Then they become defensive. What? unfair caricature? Sure, but in some cases this is precisely what does happen. And while there are many other caricatures I could have brought out, the bottom line is that there are many people in the world that simply do not think about these things and yet still believe them quite strongly. And to ask them why is apparently some great crime. The reasons are many, and I simply cannot address this whole issue here. Much of it has to do with the fact that these ideas are generally inculcated during childhood, and therefore they are associated with emotions and relationships of supreme meaning to people. We have to remember that religion is tied to many people’s personalities in ways taht will not be parsed easily. And ultimately it may not be possible to divorce the religion from the person, but we can at least provide a template for keeping their minds sharpened in order to loosen the particular beliefs in the hope of them not blindly passing on the associations to their own children. This is, ultimately, a plan for the future more than the present. One must not let oneself be deceived by the word ‘deception.’ One can deceive a person for the truth’s sake, and (to recall old Socrates) one can deceive a person into the truth. Indeed, it is only by this means, i.e. 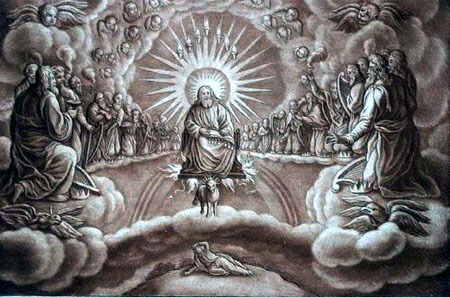 by deceiving him, that it is possible to bring into the truth one who is in an illusion. I think that this notion contains a fair amount of merit. What this means to me is that we need to prepare ourselves to be deceived, at least in the sense Kierkegaard means here, in order to allow ourselves the possibility that we are ourselves subject to some illusion. We need to keep a tentative level of certainty concerning our beliefs and accepted ideas, as they may be shown to be incomplete (if not completely wrong) in the future. And this is one reason I respect the scientific method so much. It is a method that encourages people to disprove the hypotheses we generate. It is a method that has incorporated this perpetual self-challenge and has allowed us to accept theories as provisionally true because no better explanation has been presented. 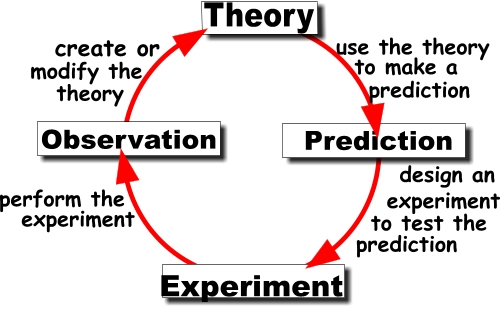 And so one strategy should be to make sure that people understand what the scientific method is and how it works. One pervasive idea I run into is that the opinions of science and religion are on equal epistemological grounding. 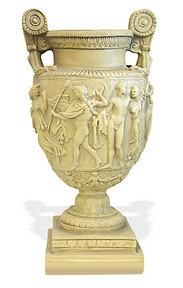 They believe that there really is a controversy between evolution and intelligent design. They don’t understand that these two ideas arose via opposing methods, and exactly what this implies. How will you know what you believe is true is justifiable if you do not submit them to the criticism they may deserve? How strong is your ‘faith” if it goes unchallenged? And what kind of challenge is it if you only pursue the argument from the side which you already accept? I just love how, when challenged, creationists will appeal to Answers in Genesis( or creationism.org, ICR or some other similar source), but almost never have even heard of TalkOrigins or can even define evolution correctly . And as the understanding of this method, it will give a new tool in understanding how we understand, and it will allow people not just to use the resulting technologies of science, but to understand how it works. We should, in terms of our own beliefs, become so inspired by this method. We should become the “new philosophers” (as Nietzsche called them) that are willing to experiment and test our views against the world and to allow ourselves to transcend humanity so that we may one day become better, the ubermenschen. We cannot simply crawl along in the hope that progress with just happen. The change begins with our own willingness to challenge ourselves. For if everyone is challenging themselves, then nobody has to do it for you, right. Actually, I’m not even sure of that. I still think that there will always be a need for others to challenge us as we do have blind-spots where others can see. Even the most ardent and honest attempt to be self-challenging can be supplemented with help from others. There are people out there that will always resist criticism. Perhaps nothing can be done for them. But for those that may be willing to hear, but who are not being challenged, we must press on. I will continue to encourage people to challenge their beliefs, their worldviews, and their culture. If you have a better way–a better hypothesis–for how to deal with rampant irrational and ignorant beliefs, then by all means get to work. So, that being said, bring on the challenges.